Book you say? Why yes, glad you asked. 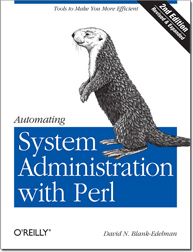 Once upon a time, I wrote a book for O’Reilly called Perl for System Administration about how to use my favorite programming language to help with my favorite profession. I wanted to write the book that I wished I had as I was learning my way in the Sysadmin and Perl worlds. That was the first Otter book. And it was well received. Pan ahead a number of years (far too many, but that’s a blog post for another day). It’s taken me about two years of pretty intense work, but now an updated and considerably expanded (close to 50% bigger) edition has seen the light of day. Along the way it got stuffed with more of the “why” of sysadmin, more of the “which” of Perl, and less of the “how”. And that’s how we got to the new title. Why buy an Otter book? It’s an enjoyable read (I like the stuff I write about and it shows). There’s humor and whimsy throughout because that’s the way my brain works and I wouldn’t want it any other way. I’ve added stuff I’ve learned from my 25 years in this field so you can benefit from my trials and errors without having to go through them yourself. That’s where the “why” and “which” I mentioned before come in. I think learning how to effectively automate portions of your sysadmin world can really improve your life. I’ve had people tell me so after they read the first edition. They’ve also said it has helped to take them to the next level in their sysadmin and Perl thinking. You deserve to use the best tool for the job. And in many cases only you can decide what that is. I strive in the book to give you the info you need to make that decision. Otters are cool. Specifically sea otters. Still not convinced? You can find the full table of contents in PDF form here: toc.pdf. Go ahead, buy it. You’ll be glad you did.